It is not enough to just build a cool Furniture product if the avatar doesn’t know how to interact with it, and you can’t move it around in the 3D space. This is were Nodes come in. 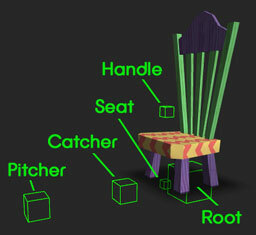 Nodes are the means by which your product tells the avatar how to stand, sit, and even move in and around your furniture item. In the case of something as simple as an end table, you might only need a Root Node in your model, but for something like a party hot tub, you may end up with dozens of Nodes to tell all your friends where they can sit. ROOT Node – This is the root of your product and should always be placed at the base of your furniture model, with the Root Node’s center intersecting with the floor. The Root Node is also where the “move” handle will appear when you are moving or editing your Furniture in the IMVU 3D window. CATCHER & PITCHER Nodes – These Nodes are always placed at the exact same distance apart from each other, and are the points at which two avatars start to perform a cooperative animation, like a hug or high five. There is only ever ONE Root Node per Furniture product. Before you can export the various parts of your Furniture product, you have to make sure that everything is relating correctly with each other. All products in IMVU are built like the skeleton of a human body. There is a head, and all the bones are then linked and relate to that head. Furniture Products are no different. Think of the Root Node as the head of your Furniture skeleton. You will need to link all other Nodes to that Root Node for your model to export correctly. In the above image you can see how the Root Node is at the top, with all of the other Nodes indented below it. Furniture products have relatively simple hierarchies, these get more complicated as you start working on different kinds of models. You will also notice that the 3D Mesh is not included in this hierarchy. 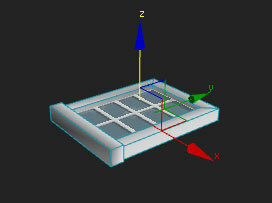 This is because the Mesh will later be Weighted to the Root Node, rather than Linked to it. Here is a video tutorial that walks you through the process of creating, linking, skinning, and exporting Nodes in a typical furniture item. 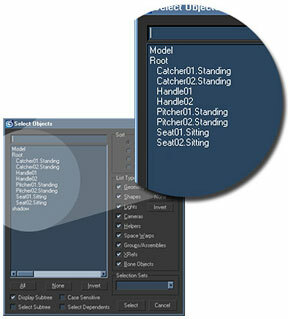 To get a good look first hand at a Node Hierarchy, be sure to download the Furniture example models available in the Furniture Product Introduction tutorial. The topic of Nodes is covered in other tutorials as well. We encourage you to check out more about how Catcher & Pitcher, See-Through, and Animated Nodes work within your Furniture product.